Capacitive Touch Screen consists of a glass panel with a capacitive (charge storing) material coating its surface. Unlike resistive touch screens, where any object can create a touch, they require contact with a bare finger or conductive stylus. 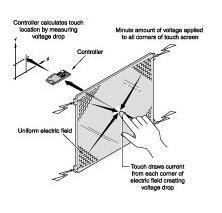 When the screen is touched by an appropriate conductive object, current from each corner of the touch screen is drawn to the point of contact. This causes oscillator circuits located at corners of the screen to vary in frequency depending on where the screen was touched. The resultant frequency changes are measured to determine the x- and y- co-ordinates of the touch event. Capacitive type touch screens are very durable, and have a high clarity. They are used in a wide range of applications, from restaurant and POS use to industrial controls and information kiosks. 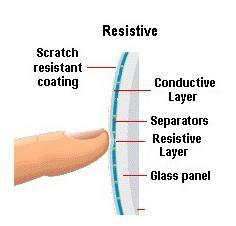 Resistiveb Touch Screen responds to the pressure of a finger, a fingernail, or a stylus. They typically comprise a glass or acrylic base that is coated with electrically conductive and resistive layers. The thin layers are separated by invisible separator dots. When operating, an electrical current is constantly flowing through the conductive material. In the absence of a touch, the separator dots prevent the conductive layer from making contact with the resistive layer. When pressure is applied to the screen the layers are pressed together, causing a change in the electrical current. This is detected by the touchscreen controller, which interprets it as a vertical/horizontal coordinate on the screen (x- and y-axes) and registers the appropriate touch event. Resistive type touchscreens are generally the most affordable. Although clarity is less than with other touchscreen types, they're durable and able to withstand a variety of harsh environments. This makes them particularly suited for use in POS environments, restaurants, control/automation systems and medical applications. AR <= 0.5% Photopic Reflection, a vacuum deposited antireflective optical coating that is applied to the outer surface of the sensor armor glass. It has a relatively high temperature process so the coating is very durable and is designed to meet industry standards such as SAE AMS-2521 and MIL-C-675. AccuTouch five-wire resistive technology is the workhorse of resistive touchscreens, providing unsurpassed performance. When activated with a finger, gloved hand, fingernail, or object such as a credit card, the AccuTouch touchscreen delivers a fast, accurate response every time. It is impervious to environmental conditions such as liquid spills and splashes, humidity, and washdown-the most contamination-resistant touchscreen available. AccuTouch is widely used in point-of-sale, industrial, and medical applications and is available for both flat panel and CRT solutions. Read more about AccuTouch technology. Zero-bezel configuration for seamless design to eliminate the traditional bezel that can collect dust and dirt. 4H pencil hardness resists scratching. 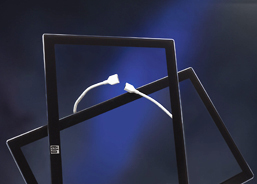 Flat cable attachments for seamless integration and customization capabilities. No lamination of additional décor foil is required which helps to reduce costs and supply chain complexity. Can be sealed to support NEMA 4/4x/12 and IP65 standards upon integration. CarrollTouch infrared technology is the survivor of harsh applications. It's the only technology that does not rely on an overlay or substrate to register a touch, so it's impossible to physically "wear out" the touchscreen. CarrollTouch technology combines superior optical performance with excellent gasket-sealing capabilities, so it's an excellent choice for harsh industrial and outdoor kiosk applications. Touched with a finger, gloved hand, fingernail, or stylus, it delivers a fast, accurate response every time. CarrollTouch infrared technology is available for flat panel solutions. Read more about CarrollTouch technology. IntelliTouch surface wave is the optical standard of touch. Its pure glass construction provides superior optical performance and makes it the most scratch-resistant technology available. It's nearly impossible to physically "wear out" this touchscreen. IntelliTouch is widely used in kiosk, gaming, and office automation applications and is available for both flat panel and CRT solutions. Read more about IntelliTouch technology. Read more about IntelliTouch Plus Technology. SecureTouch provides all the features of IntelliTouch along with tempered glass construction for superior resistance to breakage and vandalism. It's nearly impossible to physically break or "wear out" these touchscreens. SecureTouch is widely used in kiosk, gaming, and office automation applications and is available for flat panel solutions. Read more about SecureTouch technology. For CRT-based applications, iTouch technology provides superior optical and image quality. The surface wave technology is applied directly to the faceplate of the CRT, so 100% of the image's original brightness and clarity comes through. The CRT faceplate is extremely strong and resistant to scratches, breakage, and vandalism. iTouch is widely used in kiosk, gaming, and office automation applications and is available for CRT solutions. Read more about iTouch technology. The IntelliTouch Pro Projected Capacitive (PCAP) touch technology offers a fast and sensitive response and professional-grade reliability combined with a stylish, sleek design. The IntelliTouch Pro PCAP is designed for the rigors of commercial applications. The two glass solution (2GS) offers pristine optical clarity, high touch durability and long term stability over temperature. IntelliTouch Pro is available in standard screen sizes up to 32-inches with 10-point multi-touch capabilities. 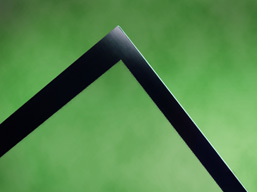 Read more about IntelliTouch® Pro Projected Capacitive .